Great brands have an ability to attract people to them. Rather than constantly having to chase business down, they have an ability to draw us into their orbit and hold us there. What these brands have is gravity. This, it turns out, is the real law of attraction. The gravity great brands possess works much in the same way the gravity we understand in the world of physics. Both are unseen, yet you can certainly feel their effect: an irresistible force that pulls at people and moves them in interesting and predictable ways. So how do brands increase their gravity? The gravity that holds our planet in place and orbits it around the sun, keeping us from flying off in any direction, is in fact generated by a number of interconnected forces. Crudely put, it is created through the interplay among mass, proximity, and velocity. In business terms, this equates to scale, connection or accessibility, and speed of interaction. This is what makes the digital world such a powerful tool for the brands who use it correctly. It allows you to get closer to your customers, to develop scale and distribution with limited resources, and to make customer connections instant and immediate—assuming, of course, there’s a decent WIFI connection. In the “old world” business model, brands needed literal mass—a significant number of customers and a reasonable amount of money spent on distribution, marketing, and advertising—to reduce the distance to consumers before it had significant gravity. But e-commerce, mobile purchasing, online, and social are changing all of that rapidly. No longer does big business necessarily have the advantage when it comes to gravity. Today, a great idea that matters a lot to people can be procured and delivered online in a way that quickly builds meaningful scale. Digital used well allows brands to reduce distance by getting closer to people, personalizing their offering, and becoming part of their everyday lives through apps or content that is useful, entertaining, and informative. Digital does all this while allowing greater distribution and access to markets that were previously beyond reach. Mass is also something businesses can increase online. Without the need for impressive storefronts, businesses can appear larger than they might be physically and generate popularity with larger numbers, connecting to far more people than their immediate geography might suggest. Mass also drives a sense of importance and influence, both of which can pull people towards you, rather than you always having to go and seek them out. All of our decisions are ultimately driven by how those decisions will make us feel. While we rationalize our decisions post-purchase, we buy when we feel emotionally connected or aligned. When a brand supports a customer’s identity, the distance between them reduces to zero; it becomes internalized and a way of expressing who they are. Online is the ideal environment for tailoring what you offer to customers rather than taking a “one size fits all” approach. The digital world allows businesses, their products, and their services to be one click away. This makes for instant gratification, which is all about amplifying velocity. One of the barriers for e-commerce is that returning things is a hassle. This can create a sense of distance between your business and your customers. It’s critical that this process is as frictionless as possible. Mass doesn’t have to be limited to physical scale. It is just as important to build a sense of emotional significance as it is to increase your market presence. Brands that have gravity usually sell something that people care about. So often marketers (online or otherwise) make the mistake of talking just about themselves and what they have to offer. We forget to talk enough about what our customers get out of buying in. If you want more gravity, spend more time learning and sharing what is important to your tribe. Make sure your app works well, your site looks slick, and you respond quickly. 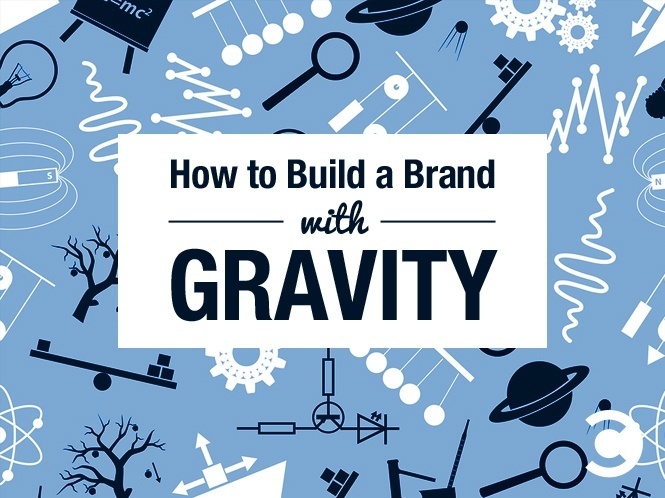 If you want to play the gravity game, make your online presence look like you have some game. If you are a start-up or an unknown brand, you can still build scale and mass if you create something worth sharing. Think like a small dog, and ignore your size when it comes to online communications. Play big, and be audacious. HelloFlo.com was a brand that launched with no money and no reputation. They built fame and fans by daring to go where other feminine hygiene brands would not with their Camp Gyno viral sensation. By behaving like a leader and breaking category conventions, they were able to make their voice far more important than their start-up size. They were able to build size of message. If you want to increase your gravity, make sure your message matters. Brands with gravity are irresistible. They are able to punch above their weight and attract far more attention, importance, and value than their turnover alone would earn. The online world levels the playing field far more than any other media, as people judge you primarily on what you stand for. Next time you’re online, remember the laws of gravity.